Time schedule has changed at Marameo Saturday class: New 10:45-12:00. The office will be open from 10:30 and please sign-up before the class! 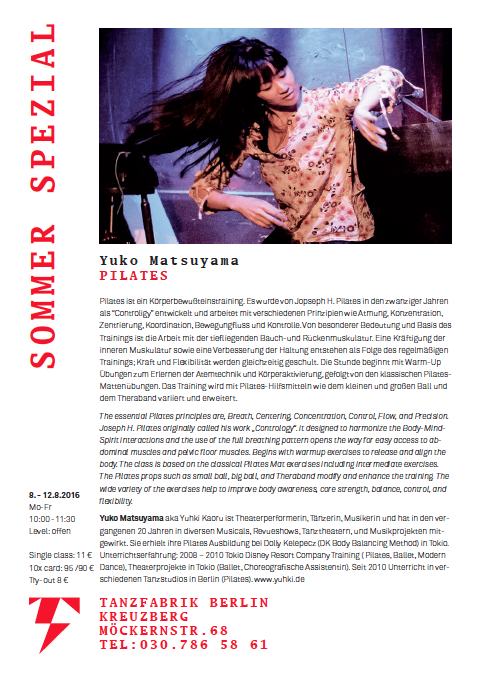 After successfully Graduate of SEAD(Salzburg Experimental Academy of Dance), she continue her creation in Berlin and Budapest. In 2018 she received her Mater of Arts Choreography from HZT(Inter-University Center of Dance Berlin). * The price for some of the morning courses at the small studio has been changed. Pilates price had change from April 2018( Single class 7€ to 9€, tryout 6€ to 8€). Tanzfabrik Berlin 3. & 10. July @ Studio 3. LET US BE FIT FOR SUMMER! 14. + 17. Apr. no class! thank you very much for your visit, carrying your health and smile to our dance studios in Berlin. I also thank you for dance & pilates teachers who’ve been giving me new information and suggestions. 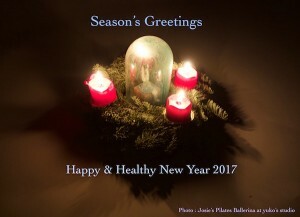 I would like to wish you all a pleasant holiday and „Guten Rutsch“ to 2017! Sat. 19.11 Marameo – No class! Then we have X’mas Holiday! Pilates ist ein Körperbewußteinstraining. Es wurde von Jopseph H. Pilates in den zwanziger Jahren als “Controligy” entwickelt und arbeitet mit verschiedenen Prinzipien wie Atmung, Konzentration, Zentrierung, Koordination, Bewegungfluss und Kontrolle. Von besonderer Bedeutung und Basis des Trainings ist die Arbeit mit der tiefliegenden Bauch-und Rückenmuskulatur. Eine Kräftigung der inneren Muskulatur sowie eine Verbesserung der Haltung entstehen als Folge des regelmäßigen Trainings; Kraft und Flexibilität werden gleichzeitig geschult. Die Stunde beginnt mit Warm-Up Übungen zum Erlernen der Atemtechnik und Körperaktivierung, gefolgt von den klassischen Pilates- Mattenübungen. Das Training wird mit Pilates-Hilfsmitteln wie dem kleinen und großen Ball und dem Theraband variiert und erweitert. The essential Pilates principles are, Breath, Centering, Concentration, Control, Flow, and Precision. Joseph H. Pilates originally called his work „Contrology“. it designed to harmonize the Body-Mind-Spirit interactions and the use of the full breathing pattern opens the way for easy access to abdominal muscles and pelvic floor muscles. Begins with warmup exercises to release and align the body. The class is based on the classical Pilates Mat exercises including intermediate exercises. The Pilates props such as small ball, big ball, and Theraband modify and enhance the training. The wide variety of the exercises help to improve body awareness, core strength, balance, control, and flexibility.